Author List: Andrew Merdith, Simon Williams, Dietmar Müller & Alan Collins. Citation: Merdith, Andrew & Williams, Simon & Müller, Dietmar & Collins, Alan. (2017). Kinematic constraints on the Rodinia-Gondwana transition. Precambrian Research. 299. . 10.1016/j.precamres.2017.07.013. 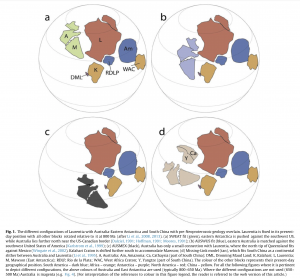 Earth’s plate tectonic history during the breakup of the supercontinent Pangea is well constrained from the seafloor spreading record, but evolving plate configurations during older supercontinent cycles are much less well understood. A relative paucity of available palaeomagnetic and geological data for deep time reconstructions necessitates innovative approaches to help discriminate between competing plate configurations. More difficult is tracing the journeys of individual continents during the amalgamation and breakup of supercontinents. Typically, deep-time reconstructions are built using absolute motions defined by palaeomagnetic data, and do not consider the kinematics of relative motions between plates, even for occasions where they are thought to be ‘plate-pairs’, either rifting apart leading to the formation of conjugate passive margins separated by a new ocean basin, or brought together by collision and orogenesis. Here, we use open-source software tools (GPlates/pyGPlates) to assess quantitative plate kinematics inherent within alternative reconstructions, such as rates of relative plate motion. We analyse the Rodinia-Gondwana transition during the Neoproterozoic, investigating the proposed Australia-Laurentia configurations during Rodinia, and the motion of India colliding with Gondwana. We find that earlier rifting times provide more optimal kinematic results. The AUSWUS and AUSMEX configurations with rifting at 800 Ma are the most kinematically supported configurations for Australia and Laurentia (average rates of 57 and 64 mm/a respectively), and angular rotation of ∼1.4°/Ma, compared to a SWEAT configuration (average spreading rate ∼76 mm/a) and Missing-Link configuration (∼90 mm/a). Later rifting, at, or after, 725 Ma necessitates unreasonably high spreading rates of >130 mm/a for AUSWUS and AUSMEX and ∼150 mm/a for SWEAT and Missing-Link. Using motion paths and convergence rates, we create a kinematically reasonable (convergence below 70 mm/a) tectonic model that is built upon a front-on collision of India with Gondwana, while also incorporating sinistral strike-slip motion against Australia and East Antarctica. We use this simple tectonic model to refine a global model for the breakup of western Rodinia and the transition to eastern Gondwana.